Over the past couple of days I’ve been eating like a pig! It’s been a week of takeaways and crap food! The takeaways have had to do this week as I’ve been busy with mam and the house which meant I forgot to order the shopping! Oops! Hubby is complaining that he’s put weight on – we both have – and that trousers no longer fit him. This is mostly due to the takeaways I’d say! I’ve eaten so many egg custard tarts that I think I may have just kicked my addiction! So with effect from next week we are going on a diet! I’m not going to keep track of calories and that sort of stuff. Neither am I going to start weighing myself. I plan on eating healthier meals and eat less sweets. I’m not going to go cold turkey either – I don’t believe in depriving myself of things I like because it’ll make me crave it even more! I am going to cut the takeaway out though – maybe just once a month for now. It’s difficult to know what to eat though. 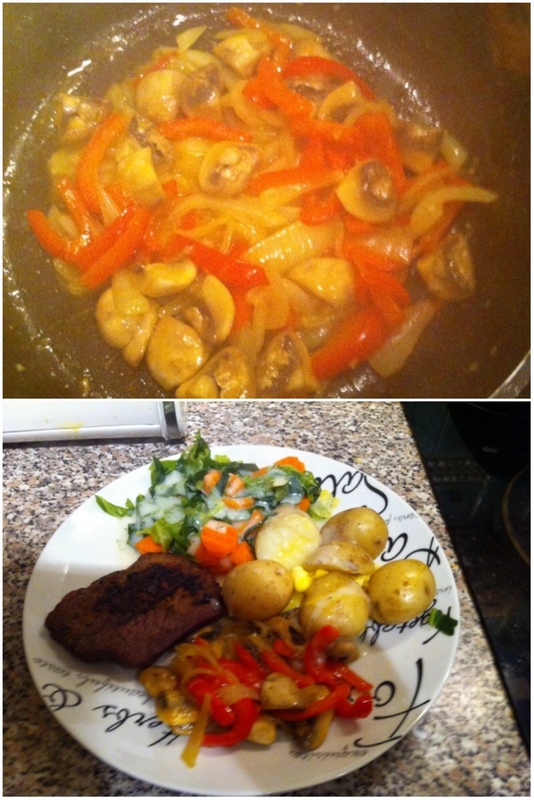 Last night we had peppered steak with potatoes, cabbage, carrots and garlic sautéed mushrooms, onions and red peppers. It was very nice but the amount of butter I put in with the mushrooms was not healthy! I don’t believe in depriving myself either, you’re supposed to enjoy eating, not suffer through it. But eating healthy is important too… Guess the secret is to find healthy food that you enjoy both cooking and eating, which is easier said than done. Skipping the takeaway is a good start. 🙂 Me and my boyfriend ate waaay too much takeaway, and just cutting that out of our diet made a huge difference in both weight and health. Well I enjoy some meat and veg so I’m starting on that now rather than something with chips and beans. I agree, skipping the takeaway will undoubtedly help – also be lighter on our wallets! Vince and I are in the same boat, it’s so much easier and convenient to eat unhealthy but we started our diet yesterday. I like snacks to much, so cutting those out will be hard (but necessary.) We can be each others motivators! I’ll try my best to motivate you! I’m going to start writing a food diary so I keep track on what I eat. I’m thinking along the lines of, if I have to write it down then it’s evidence of me having eaten it so it may encourage me to stop eating!! I don’t know if that psychology will work but I’ll give it a go!